Spider bites can be lethal. Fortunately, most aren’t. However, aside from the uloboridae family of spiders, all spiders have venom, and their degree of potency depends on which of the many thousands of spider species in the world they belong to. Once again, most spider bites are not dangerous to humans. Venom, whether it belongs to a snake or a spider, can be put into two categories: cytotoxic and neurotoxic. A couple of examples of spiders with neurotoxic venom are the black widow and funnel web spider. This type of venom attacks the nervous system directly, and that is why the wound of the bite typically has little to no noticeable marks. By restricting impulses to one’s muscles, neurotoxic venom results in rigidity, cramps, and an overall paralyzing effect. This category of venom can kill faster than cytotoxic venom and is considered to be more lethal. An example of a spider that has cytotoxic venom is the brown recluse spider. This type of venom causes necrosis, which is the breakdown of tissue and cells in one’s body. 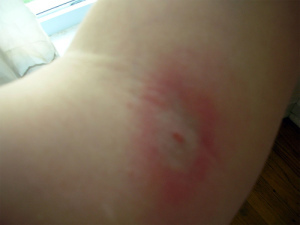 The bite from a brown recluse spider, or any spider with cytotoxic venom will result in a swelling like that of a mosquito bite and a very apparent puncture mark. Very quickly, necrosis will set in, causing the flesh around the bite to rot away. Healing from necrosis will be slow and difficult and may require immediate medical attention to prevent the chances of contracting secondary infections. Spider bites with cytotoxic venom can lead to extreme flu-like symptoms, and can be lethal in rare cases. Treatment for black widow, funnel-web, and wandering spider bites is typically antivenin. Antivenin is not used for hobo or brown recluse spiders but treatment is provided through antibiotics that is applied on the wound to reduce the chances of secondary infection. One can safely assume that hundreds, if not thousands of people are bitten by spiders on a daily basis with little to no negative effects. It is possible that even a bite from any of the spiders in the above list may not produce any harmful results. This is because not all bites will inject venom, and it is possible for one to heal own their own if little to no venom is injected. In the majority of cases, the wound will swell up like a mosquito bite and disappears within 24 hours. With that said, children or elderly whose immune systems may not be as strong may experience more severe reactions than healthy adults. Additionally, those who are allergic to spider bites may also suffer more severe symptoms that a normal person would not. If you think a spider has bitten you and you are suffering from symptoms that worry you, do not hesitate to seek medical attention by contacting a local poison center or your doctor. If you can, bring the spider that bit you with you to the hospital. This will help with the treatment process because it is not always possible to identify a spider bite based on symptoms, and treatments can vary depending on the spider that bit you. Even a mangled spider corpse is better than nothing and can assist in the procedure. What is a Wheel Spider? How Dangerous is a Black Widow Bite?